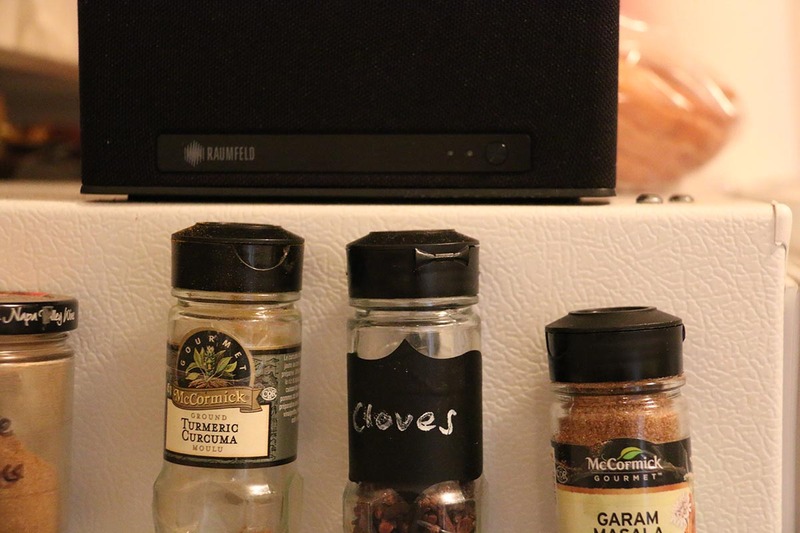 Can this wireless speaker beat the SONOS juggernaut? You’ve got to have pretty big ambitions to compete with SONOS in the wireless speaker market. That company’s already got most of the action sewn up, and with good reason, but that hasn’t stopped others from trying to get some. Raumfeld is one of them, a German company with a minimalist, all-in-one approach to multiroom audio. For the past month or so, we’ve been testing a few of their speakers; we’re planning on reviewing their soundbase soon, but in the enormous package they sent us, they included the One S, a pint-sized, boxy speaker design to use everywhere in the house, up to and including the kitchen and bathroom. We were sceptical. Like, really sceptical. We’re big SONOS fans here – their ease-of-use, superlative sound and always-on functionality won us over. Could Raumfeld really compete? There’s nothing wrong with this speaker’s looks. Ours came in all-black, its solid, five-inch-high frame covered by a wraparound mesh that hides the drivers. We really like this look; it’s the kind of device you can stash anywhere, and not have it clash with anything else. That’s a big plus. A single metal bar on the front houses the status lights and the power button, and on the top, there are rubberised volume buttons, and four shortcut buttons. It’s a simple design that works extremely well. One of the things that Raumfeld is keen to advertise is that the speaker is splash-proof, and quite happy in steamy, wet environments like your bathroom (or your bedroom, come to that). While you certainly don’t want to dunk this dude in water, it will stand up to a little bit of wetness. As long as you’re careful with the plug socket - and we really can’t stress enough that if there was ever any time to read the safety warnings in the packaging, it’s with this speaker – you can not only use this in the bathroom, but handle it with wet, soapy hands. Because of the rubberised buttons, see? And you thought these guys couldn’t hang. There are some design glitches, however, that we don’t quite understand. For one thing, there’s no Play/Pause button. If you want to control the music, you’ll need to actually use your phone. Given that the One S is designed to be used in environments where you generally don’t want to be doing that, it’s a very weird choice. Also, we had some real problems with the utility section on the back of the unit. Its recessed position made it awkward, especially when inserting or removing the unbelievably stiff power cable. Not a major thing, by any means, but it was an annoyance. For the record, you get a power slot, a reset pinhole, a setup switch and an Ethernet port. One other thing: the Raumfeld logo. We love it. It’s just gorgeous. We don’t normally go out of our way to praise something like this, but it just oozes class. Despite a couple of hiccups, it was reasonably easy to get the One S playing tunes. The Raumfeld app (iOS/Android) is far from the best we’ve seen, but it does the job in a functional, if somewhat uninspiring way. Actually connecting to the WiFi was tricky. We had a couple of false starts, and a firmware update that didn’t seem to want to install, but we eventually got it working. And while the icons at the top of the app screen may be somewhat confusing, it’s reasonably straightforward to get things like Spotify working, or to play songs from your own library. You’ve also got access to TuneIn Internet radio, with thousands of stations from across the world to listen to. Plus, there’s Tidal, Soundcloud, and Last.FM. It’s a good roundup. The rubber shortcut buttons on the top of the One S were useful, too. A single held press was enough to store a favourite, and a single press returned us to it later on. The One S is designed to integrate into Raumfeld’s multiroom system, with everything controlled by the app. We tested this out with the company’s Sounddeck, and it worked really well. However, the configurations options are hidden in settings behind an option labelled Room Configuration – fine if your speakers are in multiple rooms, but a bit confusing if you’re setting everything up in a single space. Again, this isn’t a dealbreaker, but it’s a minor annoyance – and by now, the minor annoyances are starting to stack up a little. Fortunately, the One S makes up some ground by being no slouch in the audio department. For such a little guy, the One S has a serious amount of power. The bass was squelchy and heavy, with good definition, even in acoustically-dodgy spaces like our tiny bathroom. Although the mid range felt a bit hollow, with vocals in particular suffering, the overall audio picture was solid. It’s not going to win any audiophile awards, by any means, but it gets the job done. For a speaker of this size and price, there’s very little to complain about. If you’re interested in the technical side of things, the speaker has a decent mix of drivers. There’s a 1” tweeter, a 3.5” main driver, and two 3.7” woofers, which would account for the superb bass. With an output power of 30W, it’s also got the volume to compete. We were also impressed with how well it held up between different genres. Some multiroom speakers tend to fall down when confronted with things like acoustic folk, or death metal. But the One S just kept on trucking, handling changing styles with zero problems. It’s a mark of solid engineering, and makes this an excellent all-round option. We should say that we reviewed the speaker with the help of the Raumfeld Extend, a small WiFi bridge thats creates an independent network in your home, so as not to put strain on your existing one, which would make your Netflix buffer. If you’re just going for a single speaker, then you probably don’t need to use this. If you’ve got multiple, though? It’s a good idea. We’ll review this one when we post our Sounddeck test, but for our purposes here, it works just fine. It’s not flashy. It’s not going to win any awards. It is, in a lot of ways, kind of dull. But taken on its own merits, the One S is a flawed speaker that still managed to win us over. We loved the bass, loved certain aspects of the design, and loved the fact that it punched above its weight. The Raumfeld One S doesn’t unseat anything from the SONOS range. How could it? The app design, usability and sound quality from those speakers are unmatched. But while a few strange design choices get in the way, it’s still worth picking up - especially if you don’t want to shell out for the admittedly expensive SONOS options, or you want a really good-quality speaker for the kitchen or bathroom. While it doesn’t have the One S’s water resistance or deep bass, it’s still a part of the phenomenal SONOS ecosystem. Everything from that range is a must-buy, but this is a good alternative to the One S, rather than a clear winner. The other competitor in the multiroom space is Denon. Like the One S, their Heos 1 speaker is water resistant, although we found that the audio quality wasn’t nearly as good. Hardly surprising, given the low cost. Wireless and Bluetooth speakers are the bomb. Whether you're using a portable Bluetooth speaker at the beach, or listening to music in the kitchen, you're virtually guaranteed solid sound quality and a great experience. Wireless speakers have become the quiet juggernaut of the audio industry. Ever since features like Bluetooth and WiFi became commonplace, manufacturers have been tinkering, slowly freeing us from the chaos of wires and ceiling speakers.